I'm a huge fan of the Patriots, so I was totally psyched for game day on Super Bowl Sunday. 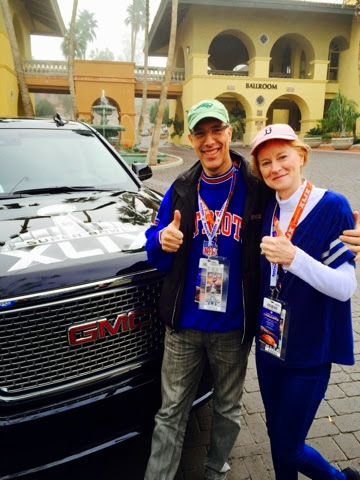 It was fun to be a guest of GMC as a #VIPwithGMC, on our way to the game, in GMC Yukon Denalis. We got to the stadium and entered the NFL tailgate. Before I tell you about the NFL tailgate, let me tell you about my expectations for University of Phoenix Stadium. When I heard we were going to University of Phoenix Stadium, I wondered, how could they be having the Super Bowl in the college stadium, that makes no sense. How could they upgrade stupid college stadium into a Super Bowl class stadium? Well when I got there and saw how awesome it was, I was informed that University of Phoenix is an online university, doesn't have a campus, and is just the sponsor of the stadium, University of Phoenix has no football team. Ha ha ha Ha ha ha Ha ha ha. 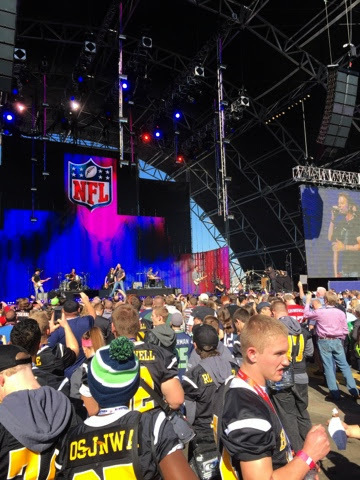 Now, we entered the NFL tailgate, and it was unbelievable. The NFL transform a vacant lot into a luxury experience for invited guests. There were food stations all around, and in the middle was entertainment by that guy who plays strings in the air, but I think I saw on america's got talent. It was a main stage two, where Gavin Degraw played, and then Dierks Bentley. Really great shows by two country artists I wasn't totally familiar with before I saw them live here. Now I'm a fan, what a great show they both put on. If the only thing we did that day was hang out at the NFL Tailgate, I would've been happy, it was probably one of the best corporate run events I've ever been to, and the weather was perfect. Next up onto the Super Bowl. Walking towards the stadium, that was a huge number of Seahawks fans in game jerseys. 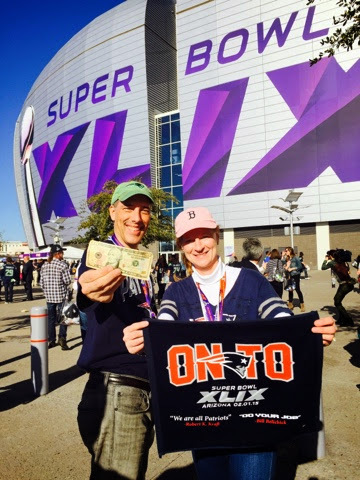 Seattle is closer to Phoenix so it was an easier commute for Seahawks fans, as patriots fans were definitely outnumbered.